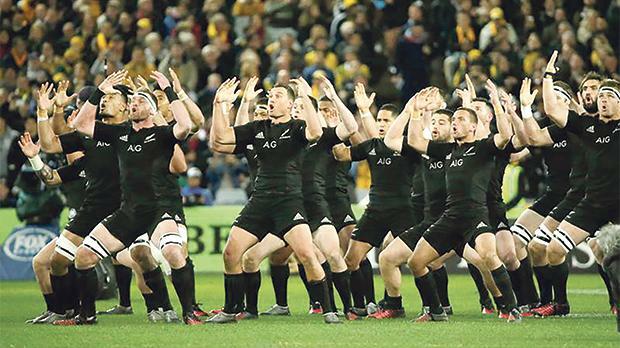 New Zealand players perform a haka. New Zealand and South Africa both went into the often-transitional post-Rugby World Cup year needing to fill some big boots and while the All Blacks achieved it with barely a stutter, South Africa’s 2016 turned in to be an annus horribilis. On the other side of the world England changed their coach but little else after their World Cup disaster and Eddie Jones transformed largely the same team into Europe’s dominant force and the unquestioned challengers-in-waiting to New Zea-land’s world hegemony. The two top-ranked teams avoided each other in 2016 and will not meet again until at least 2018, helping build the anticipation of a showdown that will be further spiced by this year’s British and Irish Lions tour of New Zealand. The All Blacks will relish that challenge having cruised through 2016 almost untroubled until their world record run of 18 victories was ended by Ireland 40-29 in a memorable game in Chicago – the first Irish victory in the fixture since it began in 1905. After becoming the first team to retain the World Cup last year, New Zealand faced what should have been the daunting prospect of replacing Dan Carter, Richie McCaw, Ma’a Nonu, Keven Mealamu and Conrad Smith – over 800-caps-worth of top-drawer experience. But if their fans were worried, they need not have been. Carter’s flyhalf replacement Beauden Barrett filled in so seamlessly that he also inherited Carter’s world player of the year title. Kieran Read proved an able new captain while centre Anton Lienert-Brown and loose-forwards Matt Todd and Liam Squire were impressive additions. New Zealand swept to a 3-0 series win over Wales and won the Rugby Championship with embarrassing ease before bouncing back from the Ireland setback with a clean-sweep three match tour of Europe. South Africa had a similarly high quality exodus within their fold in the shape of Victor Matfield, Schalk Burger, Jean de Villiers, Fourie du Preez and Bismarck du Plessis but found their replacements badly wanting. The result was the worst year in the country’s history – eight defeats in 12 tests, including a humiliating first loss to Italy on a November tour that also brought defeats by England and Wales. Coach Allister Coetzee had to work with assistants he did not choose, quotas and a ban on selecting overseas-based players and his future lies in the balance as the Union reviews the car-crash season in the New Year amid much debate on how the whole base of the sport is being eroded in one of its real heartlands. After playing so well to get to the World Cup final Australia, too, had a year to forget, losing eight of 14 tests including four in a row against England, but their coach Michael Cheika remains upbeat and the Wallabies are unlikely to be down for long. England showed how quickly things can turn for the better. Jones is the first to credit the work his predecessor Stuart Lancaster did in building the squad but it is the Australian’s winning personality and ability to instil confidence and inspire players to improve that has been the main pillar of England’s turnaround. A first Six Nations grand slam since 2003 was something to be expected Jones said, though even he allowed himself a smile of satisfaction after an impressive 3-0 sweep of the Wallabies in Australia. A first win over South Africa for 10 years, another over the Australians and two more against Fiji and Argentina made it a perfect 13 for Jones. Tagged on to their World Cup win over Uruguay it took England’s winning run to 14 – matching the previous best set under Clive Woodward in 2002-03 and another Six Nations grand slam in 2017 would secure a world record 19 successive victories. There was also a new name on the Super Rugby trophy as the Hurricanes beat South Africa’s Lions to continue New Zealand’s dominance of the competition.